A Fight to the Death…Theirs! My wife would kill me if she saw me writing, as I vowed not to do so during our vacation. However, as she is temporarily distracted, I thought I’d pen a few thoughts of today’s travesty, within the roughly 45 minute window I have. As always, the resultant PM surge was capped and attacked; first late on Friday (hence, Saturday’s “nuclear” article); and again today via the 12:00 cap of last resort algorithm; in this case, using a meaningless speech by Fed Vice Chairman Fischer as “cover,” just as gold attempted to break well above its 200 week moving average of $1,252/oz, whilst silver came within pennies of its own 200 WMA, of $18.30/oz. LOL, Fischer said absolutely nothing incremental; and indeed, spoke of historically low corporate productivity; just as Janet Yellen, in a separate speech, espoused that – contrary to her rote propaganda stance of “full employment” – minority employment trends continue to dramatically weaken. “Funny” how the HUI mining index was slammed by more than seven points beforehand, even as silver was still up, and gold barely down – via a prototypical Cartel “tactic” I have witnessed for 15 years. Not to mention, as – what a coincidence – COMEX options expiration day was today; no doubt, with lots of gold call options at $1,250/oz, well into the money until the Cartel came in to do its thing. 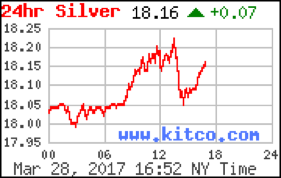 And oh yeah, 25% of the entire COMEX registered gold inventory was withdrawn today – which would seem to be a BIG deal in the world of actual physical supply and demand; as opposed to say oil and copper, which are amidst historic gluts, guaranteed to dramatically worsen for the foreseeable future. At the end of the day, little damage was done, with both metals poised for the “inevitable, decisive 200 week moving average victory” that must mathematically occur – marking the end of the nearly six year PM “bear market” (in U.S. dollar terms, as foreign-denominated gold prices have soared for years); and the beginning of the end of history’s largest, most destructive fiat Ponzi scheme. Don’t forget for a second, that these cornered rates will “fight to the death”; which fortunately for the world, will unquestionably be theirs. It is a very long and boring week without your daily articles. Thank you for writing this today. I hope your wife does not find out! It’s in fact very complex in this active life to listen news on TV, thus I simply use the web for that reason, and get the most up-to-date information.